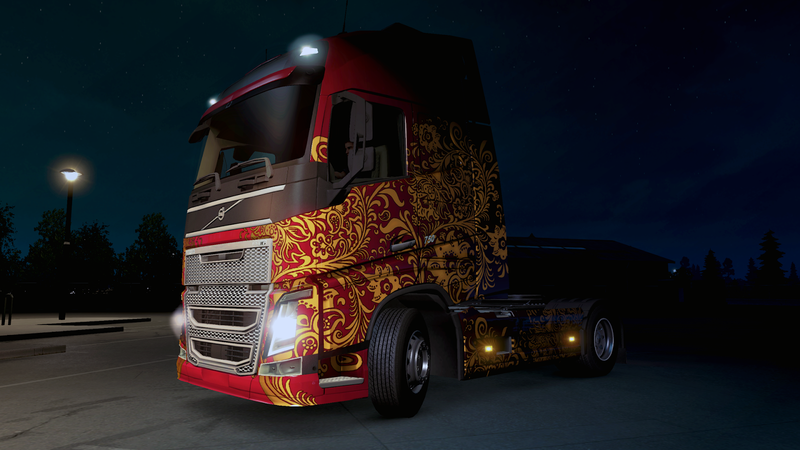 SCS Software's blog: Russian Paint Jobs Pack is now available! Russian Paint Jobs Pack is now available! We were quite surprised when we realized that Russian players form the largest player community on our World of Trucks platform (if you are interested, the next five big communities include users from Germany, Great Britain, Brazil, Poland, and USA). 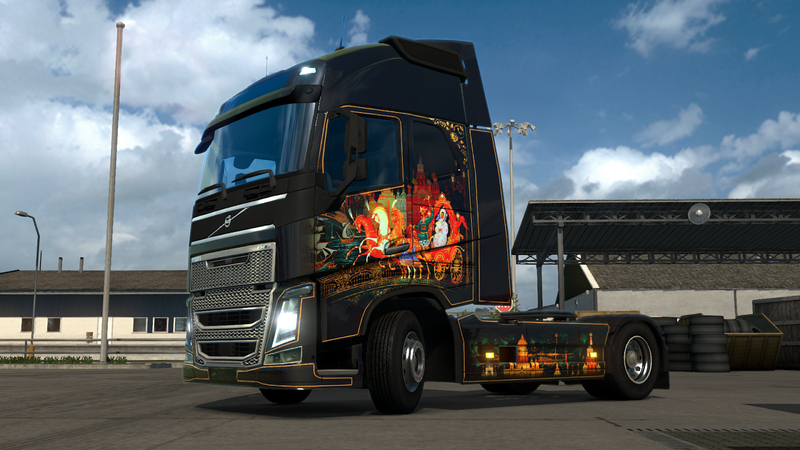 We would like to say "Thank You" to our fans in Russia by releasing a brand new truck paint job set for them today. The Russian Paint Job DLC can be purchased from Steam Store using this link. Thank you ! even dreamed of!please more news about American truck simulator!!!! !can't wait!!!!!!!! большое спасибо от всего русскоязычного сообщества ETS 2, мы ценим вашу работу и внимание. 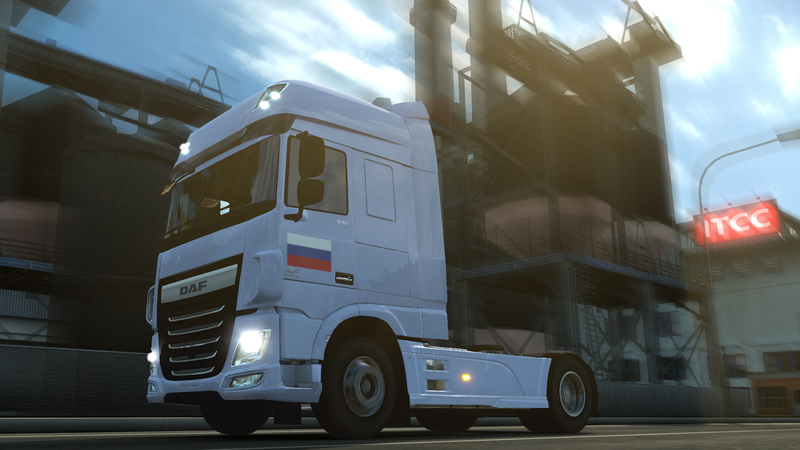 // Many thanks from the Russian-speaking community ETS 2, we appreciate your work and attention. Good. It's time to make KAMAZ. They do not care of our mouths , they should rather not deal with more important things than stupid ugly skin with painted grills or even more! Scs more time passes the more they demean level quality of service ! Nice, but I prefer Polish paint jobs. I'am waiting for a Scandinavia DLC and Mercedes-Benz vehicles. Россия - это самая лучшая страна !!! Paintjobs with ALL companies in the game would be very nice to transport some Tadeaux trailer with a Tradeaux skin. Gratz to all Russian Playes! I respect u guys, to me we are all friends, no matters the country o even the continent we all like the same game, we do use the same blog, averybody here is closer to me than people walking over here all the day. Thank you for your kind words, Vinicius! Peace from Russia! SCS, thank you for DLC! Russia - it's a great country!!! Классно, что сделали раскраску не только для Российских, но и для всех русских фанатов. Worthless, when i buy paintjob DLC nobody can see it in multiplayer. So no thanks. Thank you very much guys! Believe me, it means a lot for us, especially nowadays! Thanks SCS! It is worthy of respect! Спасибо SCS! Это достойно уважения! Do you think real is the Russian companies in Europe? Or are they kept out there? Where did you see the Russian truck on the roads of Europe? Therefore will delete these Russian Paint Jobs Pack for realisticness. Very nice, thank you SCS from the Russian community. nice great ..... when we will get some information about work on Trailers or better do you work anything on DLC - Rigid Trucks ??? Yet again we get left out! Come on SCS give Aussies their Paint Jobs lol. Discussion on this blog post unfortunately went too far from any game-related topics and has caused an undesirable amounts of fighting and flaming. Please refrain from using abusive language and keep discussions civil and on topic of Euro Truck Simulator 2. All comments for this blog post will from now on be moderated by the blog staff. Ура! Спасибо большое! Да ещё и недорого! хорошая работа! спасибо! очень долго ждал этого. / good job! thank you! waiting for this for a long time. A "thank you" to the Russian community shouldn't be "for sale". Just saying. Thank you SCS for the excellent work! Ребята, огромное вам спасибо за шикарные окраски! Только сегодня увидел новость и сразу купил в Стиме. Жду Скандинавию и Мерседес. Ahoj! Řekni mi,bude myčky pro nákladní automobily? SCS sir we korean user want to korean paint pack If korean paint pack is avilable to buy i buy on first day and many of korean user buy korean pack i love SCS Software and ETS2 thanks to reading.